Ear psoriasis can develop due to a passing disease from the scalp and can sometimes be caused by wearing glasses. It can affect one or both ears. A buildup of skin or wax scales is formed at the place of inflamed areas. Because of this, the hearing deteriorates considerably. When the disease hits the ear, you cannot delay treatment, as the rash can move to other parts of the head. 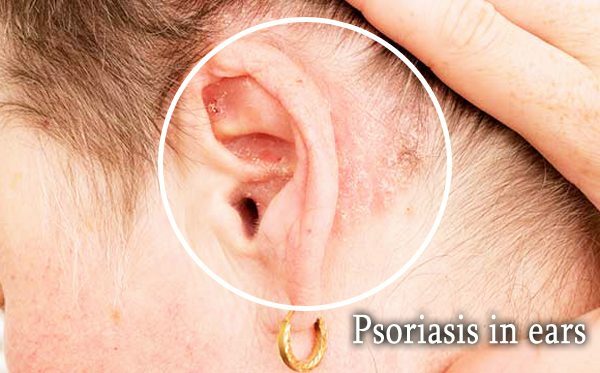 Psoriasis of the ears is not contagious, so you can safely communicate with the people with this condition. The disease is not transmitted by airborne droplets or through a contact. If you notice a pattern of sequential pain or itching on the skin around the ear, you may have psoriasis. As a rule, it occurs in the external ear canal. A small swelling of the ears. 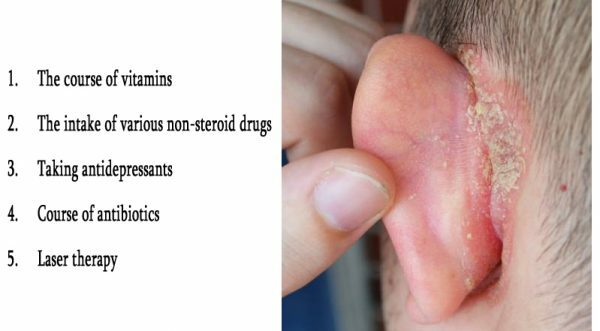 Psoriasis of the ears does not depend on age. Statistics prove that the condition can be detected both in children and adults. It is recommended to consult a doctor immediately when you notice the first symptoms. There are several complex methods aimed at strengthening the body, neutralizing the symptoms and preventing relapse. The course of vitamins to strengthen immunity. The intake of various non-steroid drugs that reduce itching, inflammation and pain. Taking antidepressants to relieve psychological stress. Course of antibiotics in case of infection. Laser therapy is prescribed to restore metabolic processes.